Steve Handy at Dbeere Yachts has signed the 38m superyacht Odyssey in a joint listing. Delivered in 2008 by the Rodriquez yard, Odyssey has an interior volume not often found in yachts this size due to her full-beam main deck. Her full-displacement aluminium hull powered by twin CAT C32 engines can muster an impressive maximum speed of 19 knots. Comfort on board is assured with five staterooms in a sleek, modern interior and a Jacuzzi on the sun deck. 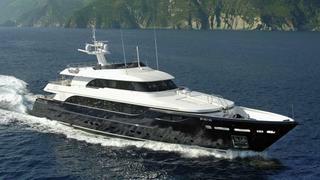 Available to view in Livorno, Odyssey is asking €5.5 million.